Get Agent Coulsen Here Right Away! “Backup isn’t coming. It will be just the four of us. We’ll be outmanned and outgunned, but Fury always said a man can accomplish anything when he realizes he’s a part of something bigger. A team of people that share that conviction can change the world. So what do you say? You ready to change the world?” – Coulson’s back at the top of his rallying speech game. The TV Show Agents of Shield has proven that a Marvel TV show can actually work. It also proves the MCU is far bigger than just the movies. I love the different characters of this show. First you have Agent Coulsen brought back from the dead after his untimely demise in Avengers The Movie. Then you have Melinda May, also known as the Calvary. Two scientist come on board with Fitz and Simmons. Then you have the lone wolf Ward enter the show with something not quite right about him. Finally we get our beloved Skye, who will be known as Quake in the Third Season of the show. What is Agents of Sheild about? Here is the plot, well basically, Phil Coulson (Clark Gregg, reprising his role from “The Avengers” and “Iron Man” ) heads an elite team of fellow agents with the worldwide law-enforcement organization known as SHIELD (Strategic Homeland Intervention Enforcement and Logistics Division), as they investigate strange occurrences around the globe. 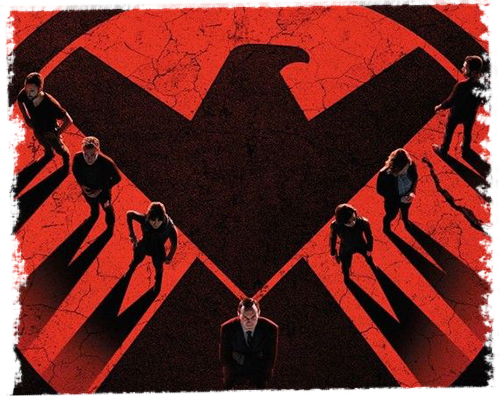 Its members — each of whom brings a specialty to the group — work with Coulson to protect those who cannot protect themselves from extraordinary and inconceivable threats, including a formidable group known as Hydra. The score is done by Bear McCreary who has also done the score to Outlander. Some may be familiar with his work. You can also find the soundtrack on ITunes. Would you like a taste of what you will find? That’s all for this week, See you Sunday for Labyrinth! Happy Listening! Previous Previous post: Candleshoe Update!